Shopping for an air ionizer for your static-sensitive work area? Have you heard about SCS’s (formerly 3M) new 9110-NO Benchtop & 9310-NO Overhead models? These two reliable ionizers feature built-in automatic emitter point cleaners, adjustable fan speeds, and steady-state DC ionization. If you’re looking for a dependable solution for ionization, these units are a smart choice. Please Note: Neither unit includes a power cord. The compatible SCS 770000 North America Power Cord is available separately. 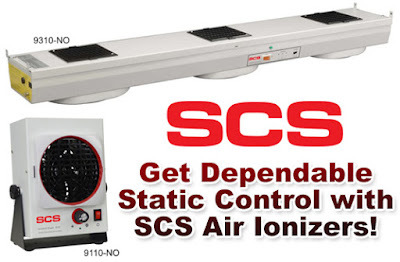 Please visit QSource.com to purchase one of these new SCS Air Ionizers. You may also contact us by phone (800-966-6020), email, or via our Web site. QSource.com also offers a complete line of SCS (formerly 3M) products.